by Troy Sidle, Pouring Ribbons, NYC. Combine, muddle, shake, strain into an old fashioned glass over one big ice cylinder, insert a slapped mint sprig. Dry but strongly fruity, with supporting notes of oak, earth, spice, and subtle floral tones. Good sipper. Joaquín made the second drink for me after I requested something with the Clear Creek Pear Brandy, which I've been obsessed with lately—it's a great spirit, and a great early summer flavor. He made it more pear-forward for me than he would have otherwise, though the tequila contributed earthy and floral notes that complemented the pear very well. He left the drink unnamed, so I gave it the Spanish name for 'rattlesnake,' after the original Diamondback cocktail it riffs on, and after the Crotalus oreganus, a rattlesnake whose territory spans from Clear Creek's Oregon to Calle 23's Mexico. Combine first five ingredients in serving glass and fill with pebble ice or crushed ice. Swizzle til well-chilled. Top with more ice, 1-2 dashes of Peychaud's and Angostura bitters, and a thin lemon twist snaked around the base of a slapped mint sprig. Serve with a short straw. Next up is Dan's Cynar + Smith & Cross thinger. 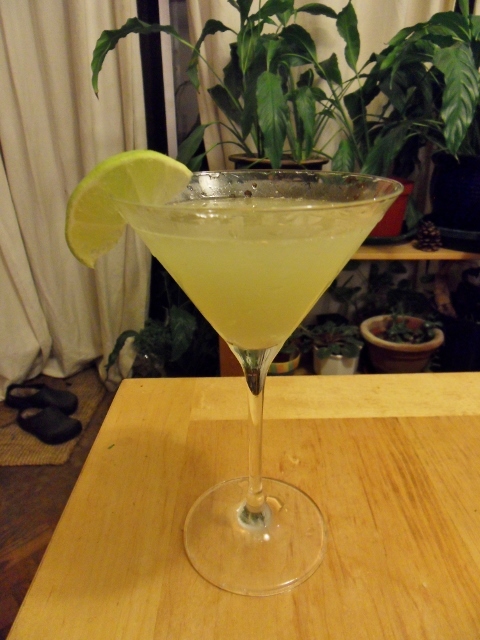 This is the Daiquiri-type drink I made from the Kaffir Lime rum I started infusing a few weeks ago. The lime leaves are a really good ingredient I think, but this was not the best drink.It had a slightly unpleasant stickiness and I didn't like the flat sugar taste with the unusual flavour of the lime. Once I tasted it I thought the lime rum would be nice with some non-citrus fruit, so I'll try that next time, but I manfully forced this one down anyway. It's called a Justesse. On the weekend, I wanted a G&T but had no tonic so I tried this quick, cool and refresher from the kitchn and found it a pretty good substitute. I like this and found it more interesting than most tall drinks. I really liked EvergreenDan's Wedderburn or Bite cocktail originally posted without a name over in the Daiquri thread. Truly more than the sum of its parts. 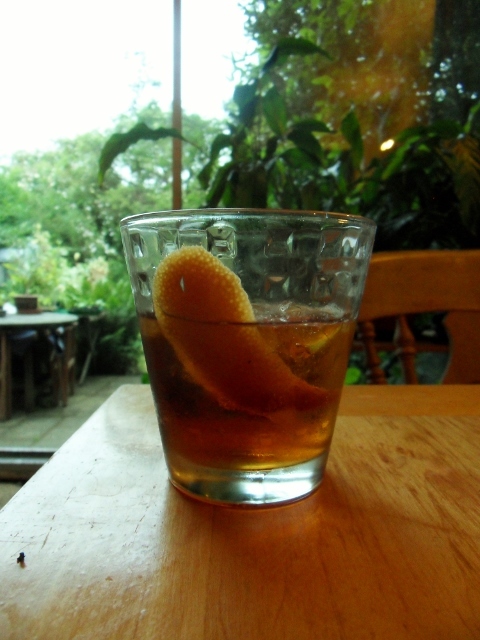 Using my newly purchased Amaro CioCiaro as an Amer Picon/Torani Amer substitute, I went with a Hoskins cocktail and very much enjoyed it. It's a very pretty pink drink, floral and fruity, without being sweet. I like it. Tonight I made Dan's Wedderburn or Bite with Wray & Nephew (didn't have an old hiking boot lying around to complete the Smith & Cross substitution). Fantastic. Though deserving of a catchier name, I think. Tonight I made Dan's Wedderburn or Bite ... Though deserving of a catchier name, I think. I tried with a ballet slipper and was perfectly satisfied. A few classic warm-weather drinks these past few days. For those who have not tried the Breckenridge Bitters, they are in the same family as Campari, very much an aperitif. I have read they are somewhat similar to Gran Classico, which I have not had the pleasure of sampling. To my mind they are mellower than Campari, both a bit less bitter and much less syrupy. How do you make the sage honey syrup? FrogPrincesse,How do you make the sage honey syrup? Mukki- That was a little ambiguous I realize. It's just a 1:1 syrup made with a local wild sage honey. Hassouni - it's spearmint. I use Miracle Grow every once in a while (and whey from ricotta production; I read that some plants liked it).... It grows in a pot and has been trying to take over neighboring pots. I do my best to keep it under control! A post by Olmoelisa reminded me to make a Campari Spritz. Yum. The gin is made in Western Australia and is made with various native spices. Was it good, ChrisTaylor? Do you know which spices were in it? I think I like it. I've yet to try it in other contexts: I'll get around to a Last Word and maybe even a Martini, even tho' I've yet to develop any taste for them. It was essentially a blind buy. 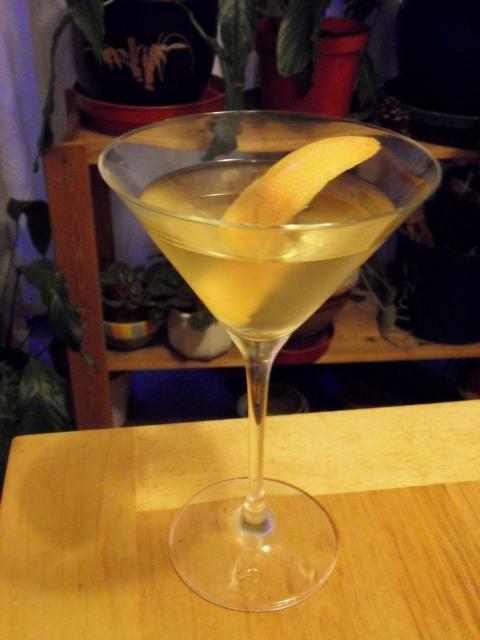 The store didn't have a sample taster avaliable any more but I was able to try their London Dry-style gin, The Sabre. I enjoyed it enough to take a risk with The Cutlass. This is from the West Winds website. The salesman told me there was some lemon myrtle in there and, given the pepperiness of this and The Sabre, I expect there's some native pepperberry too. As you can see, I garnished my G&T with lime. I guess I'll have to pick up some capsicum--or maybe a jalapeno--tomorrow. Thanks Chris! It sounds pretty far out. Tomato eh? Bush tomato is a nightshade but, according to Wikipedia, maybe more closely related to aubergine than tomato. Booze jacked with eggplant is probably scarier than booze jacked with tomato, though. Paloma with freshly squeezed grapefruit juice. Perfection. Plus an improvised pineapple and gentian monstrosity. Let us never speak of it again. There are bitters or the lime-it's not brown. Been enjoying Spiced Hemingway daiquiris lately with Sailor Jerry, Luxardo maraschino and Ruby Red grapefruit juice. The spice seems to give the drink a bass note that's missing from a plain white rum version. Very refreshing. Not quite as good as with real Cuban rum, but not a bad lateral move given the unavailability of the Havana Club here. Toby Maloney's Three Seasons with Pimm's No. 1, Junipero gin, muddled lime, lemon, orange, cucumber, strawberry & mint, topped with soda. It's a very subtle drink and a good way to appreciate the grape and citrus flavours of the main ingredients. It's very dry obviously and the nice bitterness is quite pronounced. The sweetness and spices from the Cointreau come through at the end. I really liked it. Shake, strain into ice-filled Collins glass, top with ~1 oz of club soda. Eh. Next time I definitely would cut the simple. It wasn't awful and has potential, but I'm not sure what else is needed to get it there at the moment.